DK: I was fascinated with the filmmaking process since I was little. When I was 9 my parents bought me my first High 8MM video camera and I’ve been telling stories ever since. I’ve never been one who can work in an office or behind a desk for too long. Filmmaking may have its general guidelines when it comes to creating an overall production, but the stories and experiences with each project are never the same. As storytellers we are always learning from each production and finding new ways to bring our stories to the audiences in our community, and around the world. I also love being on set. My wife and friends can testify to the fact that when I’m not on set or writing something for a long period of time I get a little anxious. DK: The film in called “Story Time” and it was a short I produced with writer/director Levi A. Taylor and his company Crooked Pictures. Levi and I met in 2009 at a screening of his first high concept short film “Way Up North”, and we have been making movies together ever since. Levi is still based in Alaska and “Story Time” is one of several shorts based on real events that took place in his life growing up in Alaska. This film depicts the philosophies and upbringing Levi and his siblings experienced growing up with their father, who was a life long Alaskan with a very interesting past of his own. “Story Time” was the second of six films we have produced together. The film had a small run in film festivals in the lower 48 and screened at multiple venues around Alaska. Elements of the film are being used as recreations for a docudrama series we are currently producing. DK: As far as Tri-Seven and Crooked Pictures is concerned Levi and I are putting the finishing touches on our latest film that took more than a year to film entitled “Conspiracy Pie”. The cast includes “Story Time” star Evan Silcox and his co-stars Zane Penny and Rebecca Barker. We are also in pre-production for our first large scale feature film to be shot back in Alaska in 2017 entitled “Finding Fire”. Here in Denver I am continuing to work as a full time Assistant Director for feature films and commercial productions, and developing several narrative and documentary features with some of Colorado’s finest storytellers. DK: In almost all my films I’ve had a character at some point along the way named Mack Grainger. While the name doesn’t always make it into the final draft of the script I try to hint toward the name in some way during production. Even if it doesn’t make the final cut. I would say it is my version of George Lucas’s throw back to THX 1138. As for me I am a big collector of movie props and posters, but last year I directed and produced several Star Wars themed short films. As a result of those films I discovered the world of custom lightsaber vendors. I now own more than 10 custom built lightsabers. DK: People can check out my work at www.trisevenpictures.com and Director Levi Taylor’s work at www.crookedpictures.com. We are also both on Facebook and Twitter. DK: I discovered EFP during my research when deciding to move to Denver, and I think this is an amazing event for upcoming and professional filmmakers. So many filmmakers looking to showcase their work to a live audiences, and not just to the internet, in most cities will find themselves with a lack of options. However, EFP has created a wonderful experience for professionals to network, and for aspiring storytellers to have a chance to meet with like-minded artist who can help them on their journey. I’m very excited to be able to screen another film for this group of storytellers, and I look forward to their reactions. 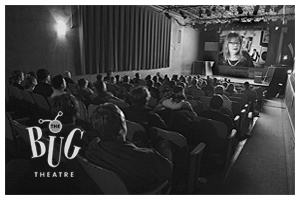 “Story Time” will be screening at the September 2016 Emerging Filmmaker’s Project at the Bug Theatre.